MISC 17-000010 : LINDA PINGIARO and JAMES P. DeMICHELE as Trustees of 48-50 ASH AVENUE CONDOMINIUM TRUST and LINDA PINGIARO Individually v. 654 MYSTIC AVE, LLC, ANTHONY FAVA, RYAN HUNT, and Gerard Amaral, Michael A. Capuano, Rebecca Lyn Cooper, Joseph Favoloro, Dorothy A. Kelly Gay, and Kevin Prior, Members of the SOMERVILLE PLANNING BOARD. MISC 17-000453 : LINDA PINGIARO and JAMES P. DeMICHELE as Trustees of 48-50 ASH AVENUE CONDOMINIUM TRUST and LINDA PINGIARO Individually v. 654 MYSTIC AVE, LLC, ANTHONY FAVA, RYAN HUNT, and Gerard Amaral, Michael A. Capuano, Rebecca Lyn Cooper, Joseph Favoloro, Dorothy A. Kelly Gay, and Kevin Prior, Members of the SOMERVILLE PLANNING BOARD. MISC 17-000519 : LINDA PINGIARO and JAMES P. DeMICHELE as Trustees of 48-50 ASH AVENUE CONDOMINIUM TRUST and LINDA PINGIARO Individually v. 654 MYSTIC AVE, LLC, ANTHONY FAVA, RYAN HUNT, and Gerard Amaral, Michael A. Capuano, Rebecca Lyn Cooper, Joseph Favoloro, Dorothy A. Kelly Gay, and Kevin Prior, Members of the SOMERVILLE PLANNING BOARD. In 1993, the City of Somerville withdrew from the Subdivision Control Law, G.L. c. 41, §§ 81K-81GG, and began to regulate the division of land within its boundaries through the Somerville Zoning Ordinances (Ordinances). 654 Mystic Ave, LLC (LLC), whose managers are Anthony Fava and Ryan Hunt (collectively, the Developers), owns the property at 654 Mystic Avenue in Somerville (Property). The Developers seek to divide the Property into three lots, each with frontage on Mystic Avenue, and construct three adjoining townhouses on the lots. They applied to the Somerville Planning Board (Board) for design and site plan review under the Ordinances for their proposed division and project. Linda Pingiaro (Pingiaro) and James DeMichele (DeMichele) own units in the 48-50 Ash Avenue Condominium abutting the Property to the rear and are the Trustees of the 48-50 Ash Avenue Condominium Trust (Trust). After the Board approved the Developers' first application, the Trust and Pingiaro individually appealed the Board's decision in case no. 17 MISC 000010. The Developers filed subsequent applications for the Property which were approved by the Board and appealed by the Trust and Pingiaro in case nos. 17 MISC 000453, 17 MISC 000519, and 18 MISC 000152. The three 2017 cases were consolidated, and case no. 18 MISC 000152 was deemed a companion case to the other three consolidated cases. The Developers have moved for summary judgment in case no. 18 MISC 000152, seeking to affirm the most recent decision of the Board with respect to the project on the Property. Because the court finds that none of the Trust's and Pingiaro's arguments require the annulment of the Board's decision, the motion for summary judgment is allowed. Judgment will enter in case no. 18 MISC 000152 affirming the Board's decision and dismissing that action. The parties and the court will confer on the proper resolution of the consolidated cases 17 MISC 000010, 17 MISC 000453, and 17 MISC 000519. The Complaint in 17 MISC 000010 was filed on January 5, 2017. The Complaint in 17 MISC 000453 was filed on August 14, 2017. The Complaint in 17 MISC 000519 was filed on September 11, 2017. Miscellaneous Cases Nos. 17 MISC 000010, 17 MISC 000453, and 17 MISC 000519 (the consolidated cases) were consolidated on September 20, 2017. The Complaint in case no. 18 MISC 000152, the action that is the subject of this motion, was filed on March 15, 2018. On April 3, 2018, case no. 18 MISC 000152 was deemed a companion case to the consolidated cases. The Plaintiffs' Motion for Judgment on the Pleadings, brief in Support of Plaintiffs' Motion for Judgment on the Pleadings, and Affidavit of Counsel in Support of Plaintiffs' Motion for Judgment on the pleadings were filed on April 24, 2018. The Defendants' Ryan Hunt, Anthony Fava, and 654 Mystic LLC's Opposition to Plaintiffs' Motion for Judgment on the Pleadings was filed on May 4, 2018. The court heard the Plaintiffs' Motion for Judgment on the Pleadings on May 7, 2018, and took the matter under advisement. This court's Order Denying Plaintiffs' Motion for Judgment on the Pleadings issued on May 11, 2018. The Defendants Anthony Fava, Ryan Hunt, and 654 Mystic Ave LLC's Motion for Summary Judgment, Memorandum of Law in Support of Defendants Anthony Fava, Ryan Hunt, and 654 Mystic Ave LLC's Motion for Summary Judgment, Defendants Anthony Fava, Ryan Hunt, 654 Mystic Ave LLC's Statement of Material Facts as to Which There is No Genuine Issue (Defs.' SOF), and Index of Exhibits to Defendants': Memorandum in Support of Summary Judgment Motion, Statement of Material Facts, and Affidavits of Jai Khalsa (Defs.' App.) were filed on July 31, 2018. The Plaintiffs' Opposition to Defendants' Motion for Summary Judgment, Plaintiffs' Brief in Opposition to Defendants' Motion for Summary Judgment, Plaintiffs' Response to Defendants' Statement of Facts (Pls.' SOF), and Appendix to Plaintiffs' Opposition to Defendants' Motion for Summary Judgment (Pls.' App.) were filed on August 31, 2018. The Defendants Anthony Fava, Ryan Hunt, and 654 Mystic Ave LLC's Reply to Plaintiffs' Opposition to Defendants' Motion for Summary Judgment was filed on September 24, 2018. The Index of Exhibits to Defendants' Reply to Plaintiffs' Opposition to Motion for Summary judgment, Second Affidavit of Jai Khalsa, and Affidavit of Mathew Lowry (Defs.' Supp. App.) was filed on September 24, 2018. The court heard the Defendants' Motion for Summary Judgment on October 16, 2018, and took the matter under advisement. This Memorandum and Order follows. Generally, summary judgment may be entered if the "pleadings, depositions, answers to interrogatories, and responses to requests for admission . . . together with the affidavits . . . show that there is no genuine issue as to any material fact and that the moving party is entitled to judgment as a matter of law." Mass. R. Civ. P. 56(c). In viewing the factual record presented as part of the motion, the court is to draw "all logically permissible inferences" from the facts in favor of the non-moving party. Willitts v. Roman Catholic Archbishop of Boston, 411 Mass. 202 , 203 (1991). "Summary judgment is appropriate when, 'viewing the evidence in the light most favorable to the nonmoving party, all material facts have been established and the moving party is entitled to a judgment as a matter of law.'" Regis College v. Town of Weston, 462 Mass. 280 , 284 (2012), quoting Augat, Inc. v. Liberty Mut. Ins. Co., 410 Mass. 117 , 120 (1991). 1. Fava and Hunt are the managers of the LLC which owns the Property by a deed dated June 13, 2017, and recorded with the Middlesex South Registry of Deeds (registry) at Book 69432, Page 78. Defs.' SOF ¶ 1-2; Pls.' SOF ¶ 1-2; Defs.' App. Exh. 1. 2. Pingiaro owns Unit 48B of the Ash Avenue Condominium. Defs.' SOF ¶ 3; Pls.' SOF ¶ 3. DeMichele owns Unit 50B of the Ash Avenue Condominium. Defs.' SOF ¶ 3; Pls.' SOF ¶ 3. Pingiaro and DeMichele are trustees of the Trust. Defs.' SOF ¶ 3; Pls.' SOF ¶ 3. 3. The Property is located in a "Business B" (BB) zoning district and a "Height Overlay District-70" under the Ordinances. Defs.' SOF ¶ 4; Pls.' SOF ¶ 4; Defs.' App. Exhs. 3-4. The rear lot line of the Property abuts a residential "RA" zoning district. Defs.' SOF ¶ 19; Pls.,' SOF ¶ 19. 4. The Developers, seeking to develop the Property have, between March 7, 2016, and December 29, 2017, filed four applications with the Board seeking Design and Site Plan Review pursuant to sections 5.4 and 8.8 of the Ordinances. Defs.' SOF ¶¶ 5-6; Pls.' SOF ¶¶ 5-6; Defs.' App. Exhs. 8-12. The applications were necessary because the Developers seek to divide the Property into three new lots and Section 8.8 of the Ordinances requires Design and Site Plan Review for divisions of existing lots. [Note 1] Defs.' App. Exh. 3. 5. Section 8.8 of the Ordinance provides that "[i]n all zoning districts, unless the regulations for a specific zoning district state otherwise, all subdivisions, lot splits, lot mergers, and lot line adjustments require Design and Site Plan Review per Section 5.4 of the ordinance." Pls.' App. p. 125. 6. Section 2.2.95.b defines a lot split as "[t]he division of a lot or parcel into two (2) smaller lots or parcels of land." Defs.' App. Exh. 3. 7. Section 2.2.163 defines a subdivision as "[t]he division of a tract or parcel of land into two (2) or more lots, building sites, or other divisions for the purpose of sale, legacy, or development at any time, where a new thoroughfare or way is needed to provide access to the lot(s) which would otherwise be landlocked." Defs.' App. Exh. 3. 4. Considerations indicated elsewhere in this Ordinance for the required Design and Site Plan Review. 3. The submittal, although proper in form, includes or creates an intractable problem so intrusive on the needs of the public in one regulated aspect or another and cannot be adequately mitigated. 4. Implementation of measures to prevent the pollution of surface and groundwater, minimize erosion and sedimentation, maintain or recharge groundwater levels, reduce the amount and velocity of surface run-off, and minimize the potential for flooding. 5. Screening of storage areas, machinery, service areas, truck loading areas, utility buildings and structures and other unsightly uses. 9. The Board unanimously approved all of the Developers' applications for Design and Site Plan Review. Defs.' SOF ¶ 7; Pls.' SOF ¶ 7. The fourth application was approved in a decision of the Board dated February 27, 2018, and filed with the Somerville City Clerk's Office on February 27, 2018 (the Decision). Defs.' App. Exh. 12. 10. The Decision granted the Developers' Design and Site Plan approval subject to 34 conditions. Defs.' Exh. 12. The development proposed in the fourth application and approved in the Decision divides the Property into three lots, and proposes to construct a two-unit residential building on each of the newly created lots (the Project). Defs,' App. Exh. 12. 11. In the Decision, the Board found that the BB zoning district does not have a minimum lot size requirement but that the residential units proposed in the December 29, 2017, application to the Board exceed the applicable minimum lot area per unit requirement of 875 square feet. Defs.' App. Exh. 12. 12. Section 8.5 of the Ordinances provides for no minimum lot size in the BB zoning district but requires 875 square feet of lot area per dwelling unit in developments of up to nine units. Defs.' App. Exh. 3. 9. Landscaping shall be installed exactly as rendered on the plan set dated February 9, 2018. There shall be no reduction in plant count or changes in plant type without prior submission to an approval by Planning Staff. 33. Each unit shall include two deeded parking spaces. The remaining two parking spaces in each garage shall be available to visitors of all three of the units that share the garage. Defs.' App. Exh. 12 (emphasis supplied). 14. The Property sits at the intersection of Moreland Street and Mystic Avenue in Somerville. Pls.' App. p. 23. Mystic Avenue runs in a southeasterly direction along the frontage of the Property at an elevation of approximately 18 feet. Pls.' App. p. 23. Moreland Street runs in a southwesterly direction, beginning at its intersection with Mystic Avenue at an elevation of approximately 18 feet, and running up hill southwesterly along the northwesterly lot line of the Property, reaching an elevation of approximately 26-27 feet where it is parallel with the rear lot line of the Property. Pls.' App. p. 23. The majority of the Property is roughly level at an elevation of approximately 19-21 feet; however, along the rear lot line of the Property there is a retaining wall, the top of which is at an elevation of approximately 28 feet. Pls.' App. p. 23. Along the northwesterly lot line, parallel to Moreland Street, there is a retaining wall which slopes from an elevation of approximately 28 feet at the rear of the Property to an elevation of approximately 19 feet at front of the Property. Pls.' App. p. 23. The Property, which has previously been developed, appears to have been leveled and would otherwise slope uniformly from an elevation of approximately 18 feet along its front lot line on Mystic Avenue to an elevation of approximately 28 feet at its rear lot line. Pls.' App. p. 23. 15. 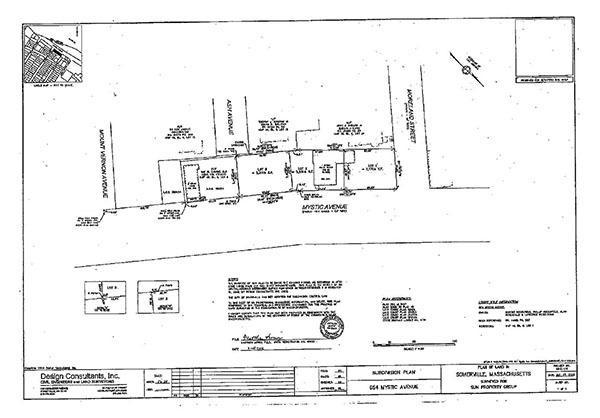 The Project proposes to divide the Property into three smaller lots, identified as Lot 1, Lot 2, and Lot 3 on a plan entitled "Subdivision Plan 654 Mystic Avenue," and dated January 27, 2016 (Subdivision Plan). The Subdivision Plan identifies Lots 1, 2, and 3, as containing 3,178, 3,251, and 3,316 square feet of area respectively. Pls.' App. p. 19. A copy of the Subdivision Plan is attached as Exhibit A. 16. The architectural plans for the Project submitted to the Board depict three, two-family buildings, connected by common walls, and situated in such a way that the lot lines dividing the newly created lots run through the middle the shared walls. Pls.' App. pp. 25-32. 17. Each unit in the proposed structure has three levels of living space and a garage located on the lowest level and partially below ground. Pls.' App. pp. 25-32. Each unit in the structure has its own access from the outside of the building, access from the garage level, a rear yard patio, and two bedrooms. Pls.' App. pp. 25-32. 18. The Developers' architect, Jai Singh Khalsa (Khalsa), stated in deposition testimony that common or party walls are walls that separate adjacent, connected buildings, and are not structural but exist to prevent a fire on one side of the wall from spreading to the structure on the other side of the wall. Defs.' Supp. App. Exh. 29. 19. Section 7.8 of the Ordinances provides that "[w]here a use, structure, development, or activity might be classified under more than one of the uses on the lines in the Table of Permitted Uses, the more specific classification shall apply; if equally specific, the more restrictive classification shall be used." Pls.' App. p. 68. 20. Section 7.11 of the Ordinances, the "Table of Permitted Uses," provides that two-family dwellings and two-unit townhouses are permitted by right in a BB zoning district but that six- unit multi-family dwellings and six-unit townhouses in a BB zoning district are allowed only by special permit. Defs.' App. Exh. 3. 21. Section 2.2.40 of the Ordinances defines a dwelling as "[a] building designed or used as living quarters containing one (1) or more dwelling units." Defs.' App. Exh. 3. 22. Section 2.2.41 of the Ordinances defines a detached dwelling as a "dwelling which is designed to be and is substantially separate from any other structure or structures except accessory buildings." Defs.' App. Exh. 3. 23. Section 2.2.42 of the Ordinances defines a multiple dwelling as a "residential building intended and designed to be occupied by four (4) or more families, where each of the units or any portion thereof, must be above or below at least one of the other units." Defs.' App. Exh. 3. 24. Section 2.2.45 of the Ordinances defines a two-family dwelling as a "residential building intended and designed to be occupied by two (2) families, where each of the two (2) units or any portion thereof must be above or below the other unit." Defs.' App. Exh. 3. 25. Section 2.2.166 of the Ordinances defines a townhouse as "[a]ttached dwelling units completely separated by a continuous vertical fire wall which are constructed so that each unit (a) has two (2) building faces with outside exposure; (b) has separate entrances from the outside; (c) reaches from the foundation to roof line; and (d) each unit is arranged, intended and designed as a residence for one (1) family." Defs.' App. Exh. 3. 26. Section 8.5 of the Ordinances, the "Table of Dimensional Requirements" provides that there is no minimum side yard in a BB zoning district. Defs.' App. Exh. 3. 27. Section 8.6.12 of the Ordinances provides that "[w]here a lot in a business or industrial district abuts a lot or district line in a RA, RB, or RC district, no building in the business or industrial district shall be erected closer to the residential line than one-third (1/3) the height of the said building, but not less than fifteen (15) feet." Defs.' App. Exh. 3. 28. Each of the three proposed garages are designed to have six parking spaces, resulting in 18 parking spaces in total. Pls.' App. p. 29. Pingiaro and the Trust dispute the dimensions of some of the parking spaces because some of the parking spaces shown on the architectural plan entitled "Garage & 1st Floor Plan" are not independently dimensioned. Pls.' SOF ¶¶ 28-30. Reviewing the plan for the garage it is plain that owing to the scale of the plan and the symmetry of the proposed garages, the Project intends to create 12 parking spaces that are 9 feet wide and 18 feet long, and another six parking spaces that are 8 feet wide and 16 feet long. Pls.' App. p. 29. To the extent that this reading of the plan could be cast as an inference drawn in favor of the Developers, the Developers' architect, Khalsa, who prepared the Garage & 1st Floor Plan avers in an uncontroverted affidavit that there will be 12 parking spaces that are 9 feet wide and 18 feet long and another six parking spaces that are 8 feet wide and 16 feet long. Defs.' App. Exh. 15. Pingiaro and the Trust have put forth no credible evidence to dispute either the measurements of the parking spaces as they appear on the Garage & 1st Floor Plan or Khalsa's averments in his affidavit. 29. Section 9.5.1 of the Ordinances requires 1.5 parking spaces for each unit with one or two bedrooms and an additional space for every six units if the structure has more than six units. Defs.' App. Exh. 3. 30. Section 9.11 of the Ordinances requires that where the angle of the parking spaces from the maneuvering aisle is 90 degrees, parking spaces be nine feet wide, 18 feet deep, and accessed by a 20 foot wide maneuvering aisle. Defs.' App. Exh. 3. 31. The architectural plans depict the following: (1) the garage floor will be at an elevation of 17 feet, 3 inches; (2) Mystic Avenue is at an elevation of 19 feet; (3) the ceiling of the garage will be at an elevation of 27 feet; (4) the rear of the Property will include a patio at an elevation of 28 feet which will also be the level of the first floor; (5) the second floor will be at an elevation of 37 feet, 6 inches; (6) the third floor will be at an elevation of 47 feet, 6 inches; and (7) the roof of the structure will be at an elevation of 57 feet, 6 inches. Pls.' App. p. 27. 32. The architectural plans show that the proposed structure would have a total height of either (1) 40 feet, 3 inches if measured from the garage floor at an elevation of 17 feet, 3 inches; (2) 38 feet, 6 inches if measured from the grade of Mystic Avenue at an elevation of 19 feet; or (3) 33 feet, 5 inches if measured from the Developers' calculated average finished grade of 24 feet, 1 inch. Pls.' App. p. 27. 33. Section 8.6.20 of the Ordinances provides that "[w]here a lot abuts an RA, RB or RC zoning district line, any structure (or portion of a structure) within thirty (30) feet of said district line shall be limited to three (3) stories and forty (40) feet in height." Pls.' App. p. 124. 34. Section 2.2.14 of the Ordinances defines a basement as "[a] story with at least forty (40) percent of its height below finished grade. However, for purposes of determining compliance to the height limit requirements of this ordinance, a basement shall not be considered a story unless its ceiling is five (5) feet or more above the finished grade abutting the building." Defs.' App. Exh. 3. 35. Section 2.2.63 of the Ordinances defines finished grade as "the elevation of the reference plane representing the average finished ground line adjoining a building at all the exterior walls. When the finished ground level slopes away from the exterior walls, the reference plane shall be established by the lowest point within the area between the building and the lot line or, when the lot line is more than fifteen (15) feet from the building, between the building and a point fifteen (15) feet from the building." Defs.' App. Exh. 3. 36. The architectural plans show a calculation of the average finished grade of the Project to be 6 feet, 10 inches above the floor of the garage at an elevation of 24 feet, 1 inch. Pls.' App. pp. 26-27. 37. Khalsa avers in his affidavit that the average finished grade was calculated by comparing five spot elevations taken along each of the Property's boundary lines with the proposed finished grade in those 20 locations. The elevation of the average finished grade for each side of the Project was calculated and then those four averages were averaged together to arrive at an average finished grade for the entire Project. Defs.' App. Exh. 15; Defs.' Supp. App. Exhs. 27- 28. 38. A plan entitled "Illustrative Landscape Plan 654-658 Mystic Avenue Somerville, MA" and dated December 20, 2017 (Landscape Plan), depicts the proposed landscaping for the Project. The Landscape Plan depicts six-foot-high wooden fences located along the rear portions of the side lot lines of the Property. The proposed fences run from the rear corners of the proposed structure, along the outer lot lines to the rear corners of the Property. Pls.' App. p. 24. 39. Section 10.7.1 of the Ordinances provides, in relevant part, that "[f]ences shall not be more than six (6) feet high above the existing grade, unless specifically stated otherwise in this Ordinance (in particular reference Section 7.12, items 4-7), or specifically required by the SPGA under the review process of Article 5." Pls.' App. p. 133. 40. Section 8.6.5.b of the Ordinances provides that "[d]imensional provisions of this Article shall not apply to: front yard fences or walls not over four (4) feet high above the average natural grade, and side or rear yard fences/walls not over six (6) feet high above the average natural grade." Defs.' App. Exh. 3. Further undisputed facts are reserved for later discussion as relevant, with corresponding references to the summary judgment record. The Developers have moved for summary judgment in case no. 18 MISC 000152 seeking to have the Decision affirmed and this action dismissed. In bringing their motion the Developers have not challenged Pingiaro and the Trust's standing to bring this G.L. c. 40A, § 17, appeal of the Decision. [Note 2] On the merits of their appeal of the Board's Decision, Pingiaro and the Trust argue that: (1) the Ordinances do not allow lots to be split into more than two lots; (2) the Project is a six-unit multi-family dwelling in a Business B zoning district which is not a use allowed by-right but rather requires a special permit; (3) the parking proposed in connection with the Project fails to comply with the Ordinances; (4) the Project violates the applicable height limitation by being in excess of three stories; (5) fences proposed in connection with the Project violate the Ordinances; (6) the Project does not comply with proposed zoning amendments to the Ordinances; and (7) the developers' multiple applications to the Board violate the prohibition on repetitive petitioning in G.L. c. 40A, § 16. An appeal of a zoning board of appeals decision is de novo; that is, in an action under § 17 the "court shall hear all the evidence pertinent to the authority of the board . . . and determine the facts, and, upon the facts as so determined, annul such decision if found to exceed the authority of such board . . . or make such other decree as justice and equity may require." G.L. c. 40A, § 17. Section 17 review of a local board's decision involves a "'peculiar' combination of de novo and deferential analyses." Wendy's Old Fashioned Hamburgers of N.Y., Inc. v. Board of Appeal of Billerica, 454 Mass. 374 , 381 (2009). The court is obliged to find facts de novo and may not give any weight to those facts found by the local board. G.L. c. 40A, § 17; Britton v. Zoning Bd. of Appeals of Gloucester, 59 Mass. App. Ct. 68 , 72 (2003) ("In exercising its power of review, the court must find the facts de novo and give no weight to those the board has found. "); Kitras v. Aquinnah Plan Review Comm., 21 LCR 565 , 570 (2013) (noting the court must "review the factual record without deference to the board's findings"). After finding the facts de novo, the court's "function on appeal" is "to ascertain whether the reasons given by the [board] had a substantial basis in fact, or were, on the contrary, mere pretexts for arbitrary action or veils for reasons not related to the purpose of the zoning law." Vazza Props., Inc. v. City Council of Woburn, 1 Mass. App. Ct. 308 , 312 (1973). The court must give deference to the local board's decision and may only overturn a decision if it is "based on a legally untenable ground, or is unreasonable, whimsical, capricious or arbitrary." MacGibbon v. Board of Appeals of Duxbury, 356 Mass. 635 , 639 (1970), citing Gulf Oil Corp. v. Board of Appeals of Framingham, 355 Mass. 275 , 277 (1969); Britton, 59 Mass. App. Ct. at 72; Kitras, 21 LCR at 570. Somerville is exempt from the Subdivision Control Law, G.L. c. 41, §§ 81K-81GG, see St. 1993, c. 288, and relies exclusively on its Ordinances to govern the division of parcels of land. The Ordinances use the term "lot split" in the context of divisions of land that would otherwise be effected by an "approval not required plan" under G.L. c. 41, § 81P, of the Subdivision Control Law. A lot split is defined as "[t]he division of a lot or parcel into two (2) smaller lots or parcels of land." The Ordinances define a subdivision as "[t]he division of a tract or parcel of land into two (2) or more lots, building sites, or other divisions for the purpose of sale, legacy, or development at any time, where a new thoroughfare or way is needed to provide access to the lot(s) which would otherwise be landlocked." Nor do we interpret a [by-law] so as to render it or any portion of it meaningless.") (internal citations omitted). This position presupposes that any lot existing in Somerville may only be split once. As the Developers argue, there is no support for the position that they could not have applied for an initial lot split dividing the Property into two lots and then separately applied for another lot split further dividing one of the two lots. Whether it is properly viewed as one or two lots splits, the Board, aware that design and site plan review was triggered by the proposed lot split, believed that the division of the Property into three lots was permissible under the Ordinances. Here, where the Project is not a subdivision (it does not require a new way for access) but requires multiple lot splits, and where there is no evidence other than the Ordinances' silence on the issue, it is proper to defer to the Board's "home grown knowledge about the history and purpose of its  zoning [ordinance]." Duteau v. Zoning Bd. of Appeals of Webster, 47 Mass. App. Ct. 664 , 669 (1999). Notably, Pingiaro and the Trust do not argue that there are any factors such as lot area or dimensions which would make the approval of the requested lot splits inappropriate. In the Decision the Board found that the BB zoning district does not have a minimum lot size and that the Project will comply with the minimum lot area per dwelling unit of 875 square feet. The Board's approval of the proposed division of the Property was not based on a legally untenable ground, or unreasonable, whimsical, capricious or arbitrary. Pingiaro and the Trust further argue that the Decision must be annulled on the grounds that the Project is in fact a single six-unit multi-family dwelling rather than three two-unit dwellings and therefore is only allowed by special permit. Both two-family dwellings and two- unit townhouses are allowed by right in the BB zoning district. Six-unit dwellings or townhouses, however, are allowed in the BB zoning district only by special permit. Pingiaro and the Trust's argument is that the Project is not three two-unit townhouses, but rather is a single six-unit building, spanning three lots, that requires a special permit. In support of this position Pingiaro and the Trust argue that the building will have only one roof and one façade on the front and one on the back. The Ordinances define townhouses as "[a]ttached dwelling units completely separated by a continuous vertical fire wall which are constructed so that each unit (a) has two (2) building faces with outside exposure; (b) has separate entrances from the outside; (c) reaches from the foundation to roof line; and (d) each unit is arranged, intended and designed as a residence for one (1) family." Defs.' App. Exh. 3. The plans submitted to the Board show that the structure proposed for the Project meets the definition of three two-unit townhouses. It makes no difference that the townhouses will be separated by walls situated on top of the common boundary lines of the newly created lots. The Ordinances do not require any side yard setback requirements in the BB zoning district where the lot boundary in question does not abut a residential zoning district. The Project describes the construction of three two-unit townhouses where the party walls are situated on the common lot lines, in a zoning district with no side yard setback requirement. This is a use that is allowed by right under the Ordinances. Pingiaro and the Trust also argue that as the Project could arguably be classified as a six-unit, multi-family dwelling, § 7.8 of the Ordinances requires that the more restrictive classification be applied. The three two-unit residential buildings proposed for the Project meet the Ordinances' plain and unambiguous definition of townhouses. Guardione, 74 Mass. App. Ct at 120-121. It would have been unreasonable for the Board to conclude that the Project was actually a single structure sited across three lots and subject it to the corresponding special permit requirement. Moreover, the Project cannot be characterized as a multi-family dwelling. The Ordinances' definition of multi- family dwellings requires that "each of the units or any portion thereof, must be above or below at least one of the other units." The units proposed for the Project will not have dwelling units either above or below each other. Rather, they are side-by-side, sharing common walls, and are properly characterized as townhouses. Further, the project cannot be characterized as a single six-unit townhouse because each of the three two-unit townhouses are to be sited on three separate conforming lots. That the townhouses may be connected by party walls on the common lot lines does not make them a single structure, because, as discussed, there is no applicable side yard setback. The proposed townhouses are a use that is allowed by right under the Ordinances and the Board did not err by allowing the use without a special permit. Pingiaro and the Trust further argue that the Decision must be annulled because the proposed parking for the Project does not comply with the Ordinances. Pingiaro and the Trust argue that the Ordinances require that the Project include 16 parking spaces which are nine feet wide, 18 feet long, and include a 20 foot wide maneuvering aisle. This argument appears to rely on a miscalculation. Section 9.5.1 of the Ordinances requires 1.5 parking spaces for each unit with one or two bedrooms and an additional space if the structure has six units. Defs.' App. Exh. 3. Thus, each proposed two-unit townhouse must have three parking spaces and, further, because the angle of the parking spaces from the maneuvering aisle is 90 degrees, the spaces must be nine feet wide, 18 feet deep, and accessed by a 20 foot wide maneuvering aisle. Defs.' App. Exh. 3. This requires a total of nine parking spaces, not 16. Even if the Project were considered to be a six-unit multifamily building, such a classification would only bring the number of required parking spaces up to 10. Each of the Project's three townhouses includes a basement level garage that is designed to have six parking spaces, four of which will meet the Ordinances' dimensional requirements. The Decision included a condition which required that each unit have two deeded parking spaces rather than the 1.5 required by the Ordinances. The Project as proposed will have 18 parking spaces, exceeding the requirements set by the Ordinances and complying with the condition set by the Board in the Decision. Pingiaro and the Trust very nearly allege fraud on the part of the Developers or their architect, arguing that the plans for the proposed parking misrepresent the actual dimensions of the parking spaces, the lots, or both. Pingiaro and the Trust argue that the plans evidence an error or misrepresentation because the width of the one of the garages on the architectural plans appears to exceed the width of the lot on which it is to be built as shown on the Subdivision Plan. They maintain that the Project's design plans call for the middle townhome to have a garage that is more than 64 feet wide, but that the Subdivision Plan shows that the rear lot line of the middle lot will be 57.20 feet and the front lot line will be 54.52 feet, thus proving that there is an error or misrepresentation in the plans. This argument is the result of a misreading of the Subdivision Plan. The middle lot, identified as Lot 2 on the Subdivision Plan, has front and rear lot lines which each include two segments. Pls.' App. p. 19. The rear lot line has one segment which runs for 57.20 feet and a second segment which runs for 9.91 feet. Pls.' App. p. 19. Similarly, the front lot line has one segment which runs for 54.52 feet and a second segment which runs for 8.49 feet. Pls.' App. p. 19. There is no evidence of fraud or any other misrepresentation and the proposed parking spaces are consistent with the requirements of the Ordinances, the condition in the Decision, and the lot dimensions shown on the Subdivision Plan. Pingiaro and the Trust further argue that the Decision must be annulled because the Project violates § 8.6.20 of the Ordinances which provides that "[w]here a lot abuts an RA, RB or RC zoning district line, any structure (or portion of a structure) within thirty (30) feet of said district line shall be limited to three (3) stories and forty (40) feet in height." Pingiaro and the Trust do not argue that the Project will exceed the 40 foot height restriction. They contend that the basement garages of the proposed townhouses should be considered the first story of each structure rather than a basement, resulting in the townhouses having four stories rather than three. Pingiaro and the Trust do not dispute the measurements of height or elevation shown on the plans for the Project but rather dispute the Developers' calculation of the average finished grade. The difficulty in determining the "finished grade" of the Project lies in the currently developed state of the Property. The Project in effect will be three townhouses constructed on the location of a previously excavated hillside. The Developers calculated the finished grade to be at an elevation of 24 feet, 1 inch. The Developers concluded that there was no point where the ground level slopes away from the exterior walls of the proposed structure, and calculated the average grade of the ground abutting the exterior walls of the proposed structure consistent with § 2.2.63 of the Ordinances. This was done by taking five elevation measurements along each lot line, calculating the average proposed finished grade on each side of the proposed structure, and calculating an average finished ground elevation for the Project by taking the average of the average grade for each side of the proposed structure. The Developers calculated that the average finished grade will be 6 feet, 10 inches above the existing grade at an elevation of about 24 feet, 1 inch. Based on these calculations, the ceiling of the proposed basement will be 2 feet, 11 inches above the average finished grade with more than 40 percent of the basement being below the finished grade. Pingiaro and the Trust argue that there will be substantial slopes away from the exterior walls of the proposed structure and that for that reason the proper measurement of the finished grade is an elevation of 18.5 feet found at the front lot line of the Property along Mystic Avenue. If the proper measure of average finished grade is between 18 and 19 feet, the ceiling of the proposed garage will be more than five feet above the average finished grade and the garage will not qualify as a basement. While the total height of the building from the level of Mystic Avenue is less than the maximum of 40 feet, if the garage does not meet the definition of a basement, the Project would have four stories, exceeding the limit of three set by § 8.6.20 of the Ordinances. The difficulty in applying this measurement to the proposed structure is that at no point does the finished ground level slope away from the exterior walls. There is no slope away from either the front or rear exterior walls of the proposed structure. The sides of the structure are to be bounded by retaining walls which slope parallel to, but not away from, the side walls of the proposed structure. It is difficult to reconcile the unique topography of the Property with the binary measurements of finished grade offered by the Ordinances. In such a situation it is appropriate to defer to the Board's own understanding and interpretation of the applicability of its Ordinances, rather than substituting the court's judgment. Duteau, 47 Mass. App. Ct. at 669. This is particularly true in the present case where the proposed structure does not violate the 40- foot height limit and the only dispute is over the characterization of the levels to be included in the structure. The Decision of the Board concluding that the proposed structure will comply with the applicable story and height requirements is not based on a legally untenable ground, nor is unreasonable, whimsical, capricious or arbitrary. side or rear yard fences/walls not over six (6) feet high above the average natural grade." The Project as proposed includes two six foot high fences located along the rear portions of the side lot lines of the Property. Pingiaro and the Trust argue that the "average natural grade" of the Property is at an elevation of 18.5 feet, that the proposed finished grade of the rear yard is about eight feet higher, and that reading §§ 8.6.5.b and 10.7.1 of the Ordinances together requires that "existing grade" in § 10.7.1 be understood to mean "average natural grade" because the former is not defined by the Ordinances. The argument, essentially, is that because the rear portion of the lot is eight feet higher than the elevation of the Property at its frontage on Mystic Avenue, no rear fence of any height can be built because the plane at which the height of a fence is measured is the average natural grade for the entire Property, calculated, in the plaintiffs' opinion, in the same manner as for the consideration of building height discussed above. The plain reading of § 10.7.1 requires that fences not be in excess of six feet tall when measured from the level of the ground upon which they are sited. Guardione, 74 Mass. App. Ct. at 120-121. In contrast, Pingiaro and the Trust argue that the average grade of an entire property is the plane from which to measure the height of a fence. This argument is unreasonable in that where a property slopes from one side to the other it could be impossible to build a fence along a sloping lot line. The sections in question are intended to regulate the maximum height of fences no matter how a property slopes. The reasonable reading of § 10.7.1 allows the Developers to build a six foot high fence along the edges of the Property when the construction is completed. , or specifically required by the SPGA under the review process of Article 5." The Developers argue that the Decision includes conditions that require the landscaping to be completed exactly as rendered on the submitted plans, which include the disputed six foot high fences. Upon review of the Ordinances, the Decision, and the submitted plans, the Project proposes two six foot high fences that likely comply with the language of the Ordinances on fences. Further, the fences are included in the landscaping plan with which the Board has required exact compliance as a condition in the Decision. The height of the fences complies with the height limitations defined in the Ordinances or, as proposed in the Landscaping Plan, is specifically required by the Board as a condition of the design and site plan approval. Pingiaro and the Trust further argue that the Project will not comply with proposed amendments to the Ordinances. Citing to the portion of G.L. c. 40A, § 6, which provides that "[e]xcept as hereinafter provided, a zoning ordinance or by-law shall not apply to structures or uses lawfully in existence or lawfully begun, or to a building or special permit issued before the first publication of notice of the public hearing on such ordinance or by-law," Pingiaro and the Trust argue that the Decision must be annulled because the Project will not comply with proposed, but not yet enacted, amendments to the Ordinances. Id. The proposed amendments to the Ordinances have not yet been enacted and the question of the Project's compliance therewith is not properly before the court. The Project's prospective compliance with the proposed amendments to the Ordinances is not grounds for annulling the Decision. specific and material changes in the conditions upon which the previous unfavorable action was based." Id. The theory behind Pingiaro's and the Trust's argument is that the earlier applications should have been denied and that an erroneous approval is equivalent to an unfavorable final action. Although this issue was previously raised in the Plaintiffs' Motion for Judgment on the Pleadings, this court withheld consideration of the legal question until discovery had closed in all of the related cases. There is no support for the plaintiffs' position in the language of the statute. Section 16 is a mechanism to avoid the burden of repetitive petitioning by the proponents of meritless applications. A special permit granting authority acts on an application in the context of the circumstances existing at the time that the application is received. A local zoning board that has acted favorably on an application, which has at the time of a subsequent application not been annulled, has no reason to consider whether the subsequent application violates the repetitive petitioning bar in § 16 or includes "specific and material changes in the conditions upon which the previous unfavorable action was based." Id. Simply put, there was no previous unfavorable action. Pingiaro and the Trust argue that a judgment of this court annulling a decision of the Board also has the effect of retroactively barring any applications to the Board that were made following an initial erroneous approval. This would, to borrow from the Ordinances, create an intractable problem which requires both applicants and the Board to consider new applications in the context of arguments advanced in pending appeals and to essentially prejudge the outcome of the litigation when deciding whether or not the Board may properly consider a subsequent application. Such a requirement is not supported by the language of § 16. Relief for abutters aggrieved by erroneous zoning authority approvals is obtained in the courts by appeals under G.L. c. 40A, § 17, and the protections of § 16 are not available until the petitioner's application has actually been "unfavorably and finally acted upon." As the Board has approved the four applications by the Developers for Design and Site Plan Review, none of those applications violate § 16. Based on the proposal presented to the Board, the Decision approving the Developers' design and site plan is not based on a legally untenable ground and is not unreasonable, whimsical, capricious or arbitrary, and must be affirmed. The Project does not require a special permit and complies with the Ordinances' requirements for fences and parking. The Developers' application for design and site plan review does not violate the G.L. c. 40A, § 16, bar on repetitive petitions and whether it would comply with future amendments to the Ordinances is immaterial to the validity of the Decision. With respect to the authority of the Board to grant multiple lot splits and the Project's compliance with the three story height limitation, both of which turn on the precise interpretation of the Ordinances, the court gives "'substantial deference' to a board's interpretation of its zoning bylaws and ordinances," Wendy's Old Fashioned Hamburgers of N.Y., Inc., 454 Mass. at 381, quoting Manning v. Boston Redevelopment Auth., 400 Mass. 444 , 453 (1987), due to its "home grown knowledge about the history and purpose of its town's zoning by-law," Duteau, 47 Mass. App. Ct. at 669 (1999), and nothing in the Board's application of the Ordinances appears to be based on a legally untenable ground, or is unreasonable, whimsical, capricious or arbitrary. For the foregoing reasons, the Defendants' Motion for Summary Judgment is ALLOWED. Judgment shall enter in Miscellaneous Case No. 18 MISC 000152 affirming the Decision and dismissing Pingiaro and the Trust's Complaint. A status conference is set down for March 18, 2019 at 11:30 a.m. to discuss Pingiaro and the Trust's remaining claims in the consolidated cases. [Note 1] The City of Somerville withdrew from the Subdivision Control Law, G.L. c. 41, §§ 81K-81GG, in 1993. See St. 1993, c. 288. Divisions of property in Somerville are controlled by the Ordinances. [Note 2] As abutters entitled to notice under G.L. c. 40A, § 11, Pingiaro and the Trust have a presumption of standing. 81 Spooner Road, LLC v. Zoning Bd. of Appeals of Brookline, 461 Mass. 692 , 700 (2012); Marashlian v. Zoning Bd. of Appeals of Newburyport, 421 Mass. 719 , 721 (1996); Choate v. Zoning Bd. of Appeals of Mashpee, 67 Mass. App. Ct. 376 , 381 (2006).